Choose from an array of glass, design, size, and woodgrain interior colors in preserving your home’s classic look! 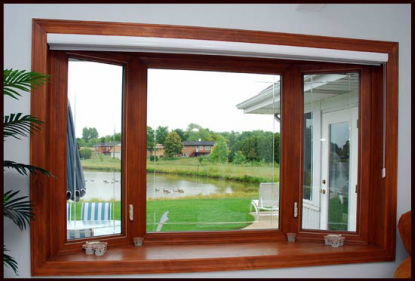 Our Bay windows provide a larger center picture window with your choice of Double Hung or Casement windows on the ends. A choice of 30-degree or 45-degree angle is certain to give you the ideal seat area you desire. Designed with stunning 3, 4, 5 or 6 equal sized sections, our Bow windows give your room new dimension and symmetrical style. Select from a variety of colors, woodgrains and dynamic glass options to make your new Bow window a backdrop of elegance in your favorite room. Available in all sizes and offer various combinations of ventilating and fixed units. Get a bay or bow window replacement estimate today.